My son and I fly fished the upper reaches of Deep Creek on 5/21 and, as there are sometimes queries here about the fishing, our experience might be useful to some others. We hiked in about 30 minutes along the PCT from Splinters Cabin after arriving at the trail head at about 12:15. I hadn't been fishing there for at least 5 years and I wasn't hopeful of much success given the variable water levels over the past few years and the fact that I have not seen any trout at all between the spillway and the hot springs in the past few years. However, we were pleasantly surprised. We caught 4 trout in about 2 hours fishing. All rainbows, all small, all returned to the water unharmed. We were using bead headed nymphs (hare's ear and pheasant tail) in size 16 on floating line. We probably should have used a bit more weight to get them down a little further and we probably would have caught more. The holes were deep and the water was running solidly. There was no shortage of fish. We had many rises and could see many more fish lurking around in the deeper holes. 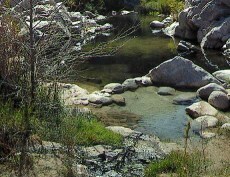 If you are a catch and release fly fisherman (there are restrictions on Deep Creek - single barbless hooks on artificial lures, 2 fish limit) I would recommend Deep Creek for plenty of fun close to Los Angeles. You will, almost certainly, have the place to yourself too.